Here you have the ability to select an application and one of its data groups for the timer. 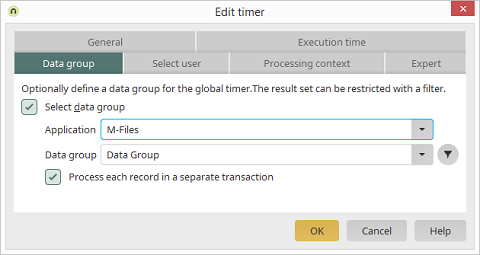 For each data record in this data group, a corresponding timer event will be generated. Opens a dialog where a filter for the data in the selected data group can be created. Has the effect that one access will occur for each individual data record. This function is recommended when processing very large amounts of stored data, such as for a data replication via a process, as errors will be skipped and the transaction duration (and with it, the duration of database locks) will be kept short. This setting can also be used to send mass emails. With it, you can set that in the case of any errors that occur, the entire sending process will not fail, but rather that specific mails will only fail to send.